Dog lovers will beg for this fun yet sophisticated glass featuring their breed’s name and likeness. In the mood for a single malt bourbone? Or maybe a refreshing Arnold Pawlmer? Whatever you're drinking, dog lovers will beg for this fun yet sophisticated glass that captures their breed's spirit. 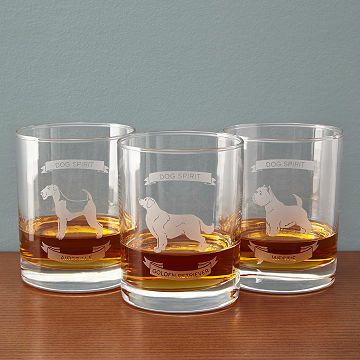 Etched with the breed name and adorable likeness, it's perfect for the pal who's teaching their pooch how to "cheers!". Made in the US. Also check out our Dog Spirit Glassware sets.